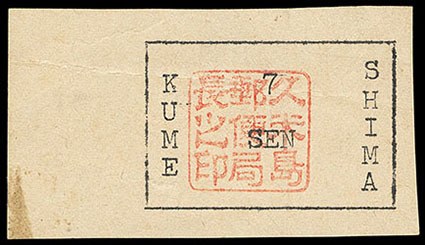 Ryukyus, Kume Island, 1945, 7s black on cream, position 16, with manuscript Kanji "kisoku" character (meaning regulation) on reverse from postal form use, without gum as issued, wide margins, some light creasing, Very Fine appearance, one of the 200 remainder stamps used as postal forms in sheet format. JSDA No. K1. In April 1946, approximately 50 sheets had fallen into disusage and were considered "needless". The reverse of these sheets were used for the creation of postal forms. Postmaster Kikuzato was able to locate some 200 of these stamps of the above remainders on Kume Shima for interested collectors in Japan. This item is one of these 200 stamps used as a postal form. 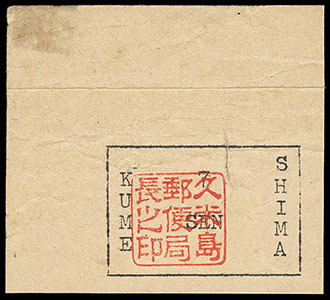 Ryukyus, Kume Island, 1945, 7s black on cream, position 1, top left corner margin single, without gum as issued, wide margins, crease in top selvage, some wrinkling and internal paper brake at top, F.-V.F. appearance, ex-M. Bush. JSDA No. K1. 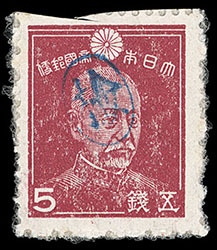 This is a rare provisional that was printed on legal-size U.S. military mimeograph paper and then validated by the red official seal of Norifume Kikuzato, postmaster of Kume. 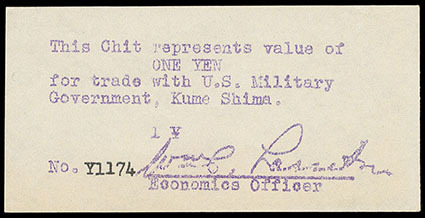 Ryukyus, Kume Island, 1945 (Aug. 1), U.S. Military Scripts, 10 sen-1 yen violet on white, set of three values: 10s, 50s & 1y; mimeographed "chits" with facsimile signature of Wm. C. Lassiter, Economics Officer, each with typed serial number "T502", "S808" and "Y1174" respectively, fresh and Very Fine, very few of each exist (R.P.S.S. PKL1-PKL3); with 2002 R.P.S.C. certificate for 1 yen value. A VERY RARE SET OF THE U.S. MILITARY 10S-1Y VIOLET ON WHITE SCRIPT. Ryukyus, Kume Island, 1945 (Oct. 1) U.S. Military Script, 10 Sen Black on Manila, mimeographed "chit" with facsimile signature of C.A. Caler, Commanding Officer, purple "10 - ENTD" handstamp on front and back, fresh and pristine, Extremely Fine (R.P.S.S. PKC1); with 2002 R.P.S.S. certificate. 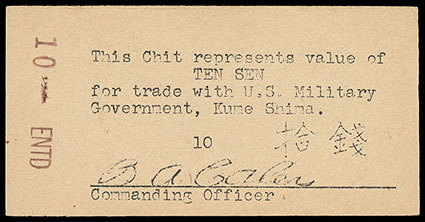 This "Chit" was issued in 1945 by the U.S. Military Government of Kume Shima (Navy) for trade with, and between, Island Civilians and the U.S. Government. The stencil was prepared by Navy Yoeman Crutchfield and signed by Navy Lt. B.A. Caler, and run off on a Navy Mimeograph machine on official paper. Ryukyus, Kume Island, 1945 (Oct. 1) U.S. Military Script, 1 Yen Black on Manila, mimeographed "chit" with facsimile signature of C.A. Caler, Commanding Officer, fresh and pristine, Extremely Fine (R.P.S.S. PKC3); with 2002 R.P.S.S. certificate. Ryukyus, Amami District, 1947, "Ken" (inspection seal) on General Nogi, 2s crimson, black seal, without gum, Very Fine, ex-Kamiyama. JSDA No. B4. Ryukyus, Amami District, 1947, "Ken" (inspection seal) on Hyuga Monument and Mt. 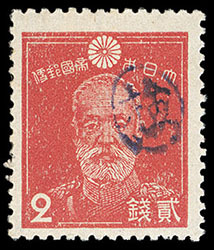 Fuji, 4s emerald, vermilion seal, late dark green printing, o.g., very lightly hinged, some trimmed perfs as result of being cut apart upon sale, F.-V.F., ex-Mori, Alexander, Schoberlin and Kamiyama; with 1995 R.P.S.S. certificate (PA9-A[C3]). JSDA No. B9. Ryukyus, Amami District, 1947, "Ken" (inspection seal) on Admiral Togo, 5s brown lake, blue seal, o.g. (interleaving adherence), some trimmed perfs as result of being cut apart upon sale, F.-V.F., ex-Kamiyama. JSDA No. B10. Ryukyus, Amami District, 1947, "Ken" (inspection seal) on Mt. 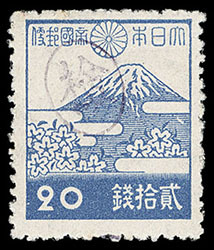 Fuji and Cherry Blossoms, typographed, 20s blue, black seal, full o.g., bright and fresh, Very Fine. JSDA No. B21. 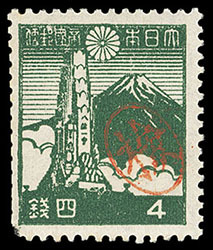 Ryukyus, Miyako District, 1947, Postmaster Tomiyama's handstamped seal on Mt. 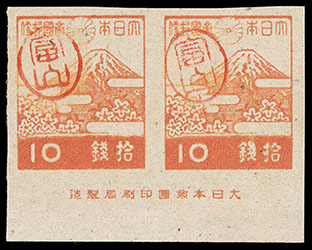 Fuji and Cherry Blossoms, 10s red orange, imperf, bottom margin imprint pair, without gum as issued, large margins, Very Fine and choice. JSDA No. M22. Scott No. 3X9; $200 for singles Estimate $200 - 300.